Ashbee Design: Holiday Entry Done! Today was day two of the holiday decorating. I happened to take the pickup truck to work this morning and as I was driving home I noticed some Winter Berry bushes on the side of the road. I knew the clippers were in the back so I pulled over, snipped a few branches and was off. My afternoon project had been decided! Years ago I used to buy greenery arrangements for the door stoop but at some point I just started making my own. It is especially easy this year because of all the tree damage from earlier storms. 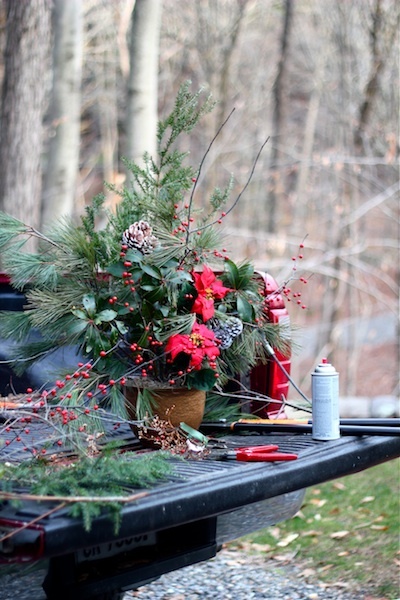 I had a choice of pine boughs already down, gathered some Mountain Laurel, the clippers and set up shop on the tailgate of the truck. I used white pine, hemlock, and some unidentified pine along with laurel branches for the greens. Into that I added the Winter Berry, some pinecones hit with a touch of white paint, and a few silk poinsettias for added color. I made two arrangements, one for each side of the door. 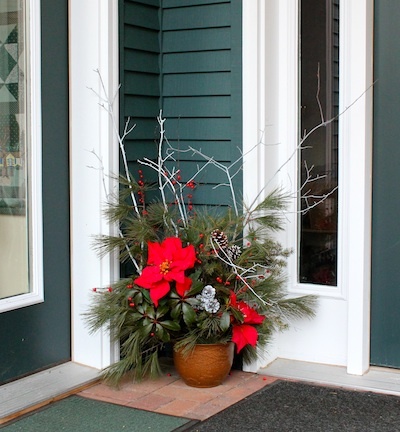 I used to place them at the front of the portico but once the snow starts, they would get buried. Even before the snow flies, the deer and turkeys would start munching on them. 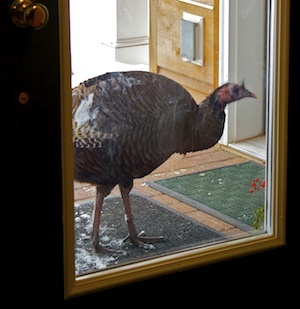 The turkeys will still come up on the stoop. The deer don't. After I placed them, I felt they needed more punch. 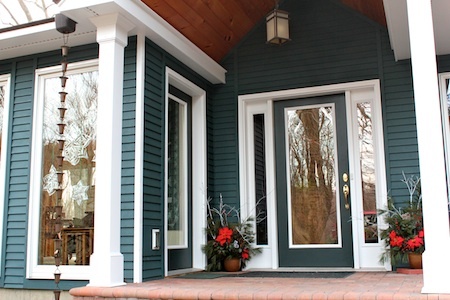 This is the first Christmas with our house painted this beautiful shade of blue green (Benjamin Moore #2136-30 Amazon Green) and the deep green pine was lost in the depths. I went out and clipped some bare tree branches, spayed painted them white and added them to the arrangement. Great addition. They pop against the deep green (which I still think looks more blue! Benjamin Moore how about Mallard Blue for a new name?) Wonderful color whatever the name. I kid you not! This was last winter from inside looking out at that same corner. I expect the same just as soon as those Winter Berries are spotted.